Knowing how to play your starting hands, understanding the notion of position, and the art of bluffing are three of the most important concepts in No Limit Hold’em strategy. Last week we introduced a new poker strategy topic: adopting an aggressive poker style. We will continue to explore the importance of being aggressive in poker by covering when and how to make use of the continuation bet. 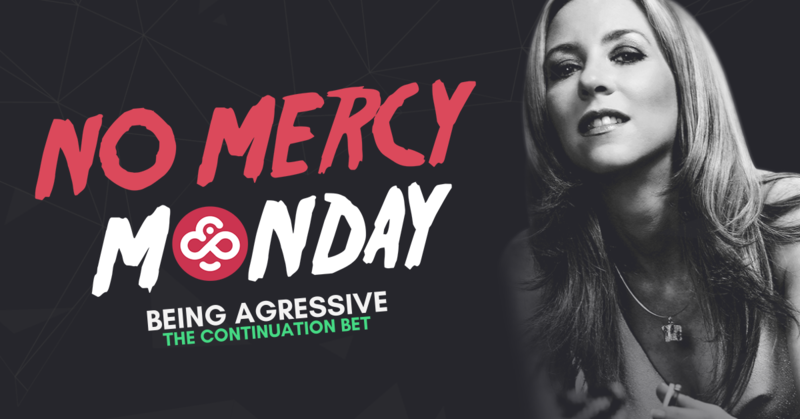 Last week we saw why being aggressive is a winning style of play in poker. When your opponents retreat into their shells, they become easier to read when they finally come out to call or to raise you. But there are other reasons why being aggressive is so much better than being passive, and one of them is direct access to a powerful weapon called the “continuation bet”. When you are the pre-flop raiser, everyone will be inclined to check after you on the flop, giving you a wide range of options, including this legendary continuation bet. Let’s say you’re in middle position holding and you are facing a standard raise. You could choose to fold, call, or raise (a fold here is probably not the best play unless there are specific factors coming into play). For the purpose of this example, let’s say that your opponent holds . Suppose that you decide to simply call his raise and the flop is . What will you do when your opponent bets on that flop? Will you call to see what he does on the next street? Will you raise to see if he really has something? Will you simply fold because you did not really connect? Now, suppose that instead of calling, you decided to 3-bet before the flop. Chances are that your opponent will check with his on this flop, giving you the green light to make a continuation bet. It would be difficult for him to try to bluff you from this spot since you were pretty aggressive before the flop, representing a powerful hand. He might even be scared if there was a on the flop because of his kicker! That’s the power of the continuation bet, hence the old saying, “if you cannot raise, don’t play the hand”. your skills and try to win my 10,000 CHP bounty! Next Post Play for Nearly 2 Million GTD in 6 Hours this Sunday!